Ichthyosaur fossil discovery at Charmouth Dorset UK. The discovery and preparation of the large ichthyosaur fossil at Charmouth. The ichthyosaur fossil was found by Tony Gill of Charmouth Fossils. 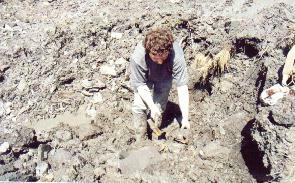 I have been fossil hunting for 25 years, it's great fun but for me it is much more a business. I own and manage 'Charmouth Fossils' and run the shop with my wife Anna and assistant Rick. This is the story of how I found and excavated 'Mary' the Ichthyosaur, one of the most exciting finds of my life. She will be prepared and exhibited, and my intention is to take you through the process of preparing a most important find - this will be portrayed on this site, as and when each stage is undertaken. I patrol the Dorset Jurassic Coast beaches and cliffs regularly, especially after heavy rain or a storm. At 6am one morning during the Easter 2000 holidays, after a week of heavy rain. I discovered a new cliff fall. The fall went through the flatstone bed which is where nodules containing some very beautifully preserved ammonites can sometimes be found. Someone had obviously been there before me, but I decided to take a look around. There was a large nodule which at first looked like a mass of jumbled fossilized wood. On closer examination I could see that it was, in fact, bone. This prompted me to examine the site further and I found some more bits, some small and three more larger nodules. The tide was coming in very quickly and started to wash the bottom of the slip exposing more pieces of fossilized bone. I sought the assistance of two of my fossil hunting colleagues, Pete Langham and Chris Moore; with the aid of a wheelbarrow, we brought all of the obvious bits back to my shop, the time was then 4.30pm. The next day we returned and dug into the slip. You can see the mud flow which is one of the dangerous features of the coastline. The excavation was carried out under the provisions of the West Dorset fossil collecting code of conduct, details of which are available at the Heritage Coast Centre (there is a link at the bottom of the page). We found a 2-3 meter length of vertebral column, parts of one rear paddle and a very large coprolite (droppings) or maybe stomach content, I don't know which as yet. 1. When large sea creatures die, they become bloated with gases and can float on the sea surface, where other sea creatures scavenge the carcass and pull parts of the body away. 2. Storms cause the reptiles body to roll around on the sea bed, so the paddles and the tail could easily become detached. 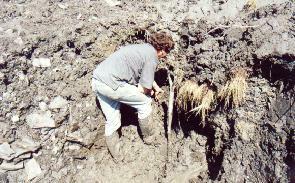 The rear part of the vertebral column has not yet been found. I monitor this part of the cliff and beach daily in the hope that tidal, storm or rain action might expose more of the missing parts. Artist's impression of what we have so far. by Christopher M. Pamplin B.Sc. ichthyosaur fossil by visiting this site. You will be able to see the bones being exposed from the rock for the first time in 180 million years. Peter Langham, who has been preparing fossils for many years, will be helping me in this task. We will be using acids and pneumatic tools. The preparation process is very slow, but over the months 'Mary' will be revealed in all her splendor. Other fossils will be added, as and when I find them, to show you the rich variety of material on offer at my shop. Anna Gill - My loving wife, without her help and support, you would not be looking at this today. Rick Taylor - Ever on hand for anything who works in the Charmouth fossil shop. Chris Moore - For expertise, help and support. Peter Langham - For expertise, help and support. Dave Costain - For expertise, help and support. Chris Pamplin - For his contribution to the site, geology knowledge and help. Richard Edmonds - For his contribution to the site, geology knowledge and help. David Sole - For expertise, help and support. Richard Austin - Press relations and some photographs. Ron Bailey - My webmaster who hasn't slept for three weeks, put up with indecisions and multiple changes of mind. The British Museum has an Ichthyosaur tooth 5 inches long, Mary's are 3.5 to 4 inches! A few years ago one of our local collectors found a tail vertebra about 10 inches across, the biggest in Mary will be 6 inches! Bristol City Museum and Art Gallery have another large Ichthyosaur discovered in 1987 by David Sole, less than 100m from Mary's location. So what other amazing fossils will be discovered in the cliffs around Charmouth in the next few thousand years? The Charmouth Heritage Coast Centre. Lyme Regis, tourist information and where to stay. 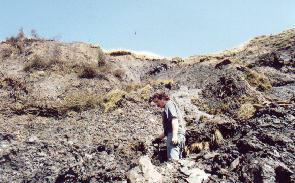 Guided tours and fossil hunting by a geologist of the area. Nigel J. Clark - Books on Fossils and other local information. Photographs of the area by Richard Austin. Get you local web page authored.